Moist and flavorful German apple cake is full of fresh apples and comes together quickly. 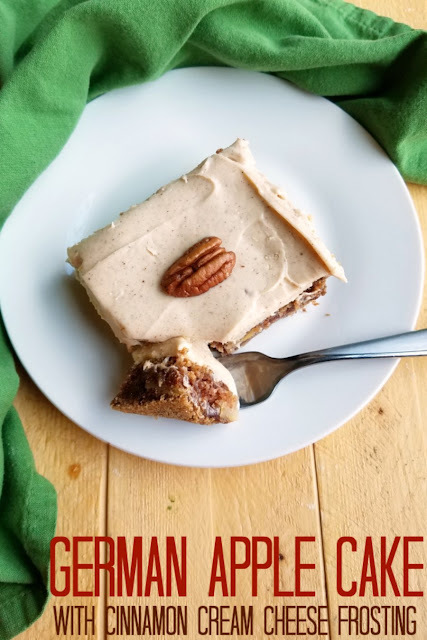 The cinnamon brown sugar cream cheese frosting takes it to the next level! 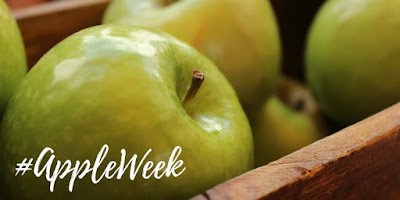 This post is sponsored in conjunction with #AppleWeek. 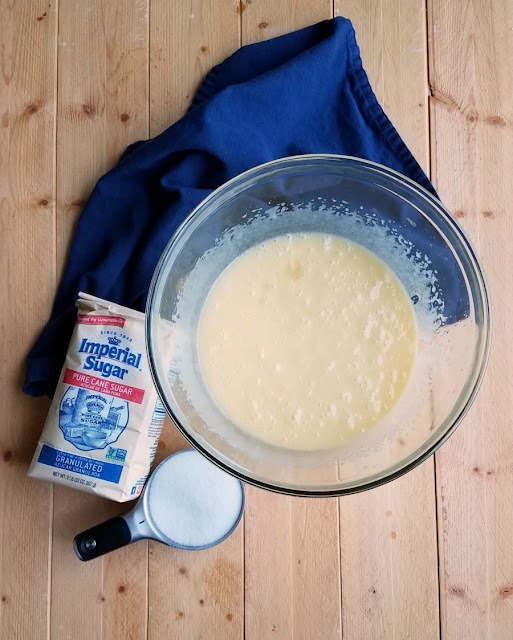 Imperial Sugar provided sugar for recipe development and a prize for readers. As always, all opinions are my own. A simple but delicious German apple cake is always a hit, especially when topped with cream cheese frosting. I gave mine a cinnamon brown sugar cream cheese frosting twist that knocked it right on out of the park! German apple cakes have always been a hit in my eyes. 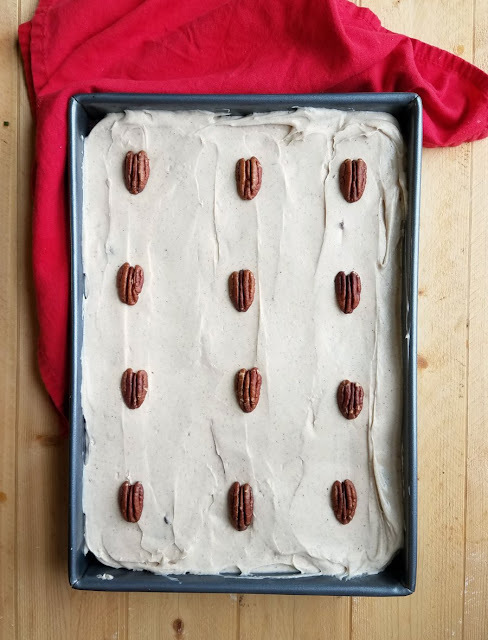 They would occasionally make an appearance at a fall get together and the combination of flavorful cake and cream cheese frosting is just perfect. I love how easily the cake batter comes together. There is nothing fancy or complicated about it. The hardest part is prepping the apples and it's worth every ounce of effort. The resulting cake is full of soft apple chunks. There is a perfect balance of sweet and spice. There isn't so much cinnamon that you can't taste the apples, just enough to tickle your taste buds. Then there's the texture. It's a denser cake, but in a good way. All of those apples help make it that way. It almost reminds me of a cross between a blondie and the cake mix box texture you might be used to. The edges are slightly crispy, it forms a slightly crackly crust and the inside is moist and delicious. Just thinking of it makes me want to run to the kitchen and bake another! I would hear no complaints about it either. Honestly you could probably stop there and serve it warm with a scoop of vanilla ice cream and have an out of this world experience. But in my world cakes need frosting! That's part of what I loved about these cakes growing up, the cream cheese frosting! Its the creamy and slightly tangy topping that brings it together. Plus that layer of cream cheese frosting almost makes it the apple version of everyone's favorite, pumpkin bars! 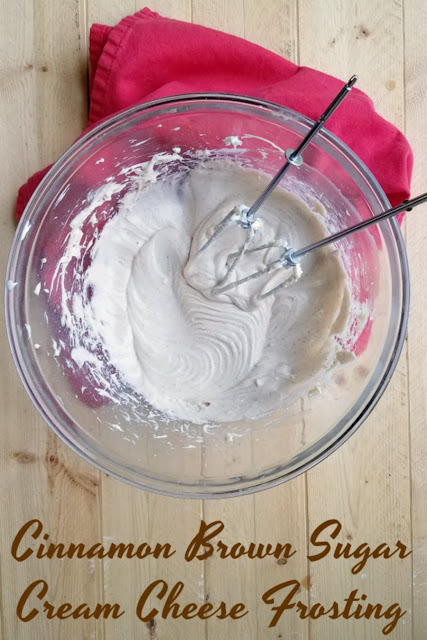 Now I could have left well enough alone and made the classic cream cheese frosting we all know and love. But that's not really my style, now is it? 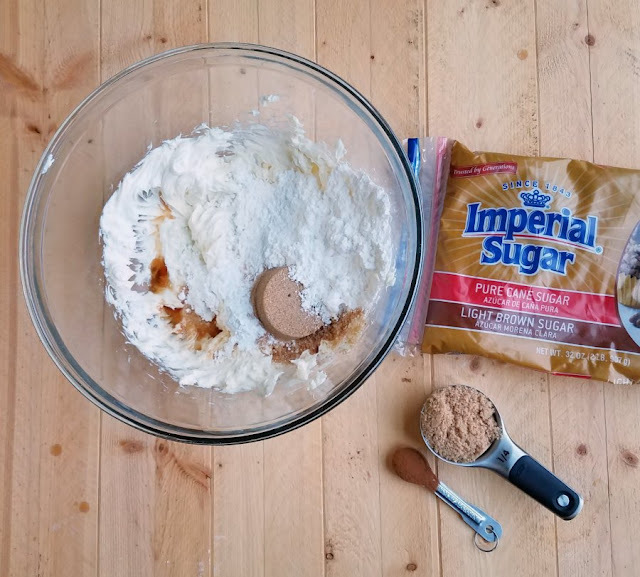 After a few minutes of staring at my pantry and the epic pile of Imperial Sugar they sent for #appleweek recipe development, an idea struck. Why not warm up the cream cheese frosting with brown sugar? And I'm glad I did. The results were still the creamy goodness with slight tang you'd expect from cream cheese frosting, but with a little something more. As I do with most cakes, I brought it to family dinner at my parents' house. Despite a large dinner, the cake basically disappeared. Even my husband went crazy over it. He was disappointed when he learned it was gone before he got a second piece. He should know by now he has to act fast for that sort of thing. Little Dude and I polished off what was left the next day after lunch. I'm sure we invited him to join too.... or maybe not! Appleweek is in full swing now and of course I had to share a cake. 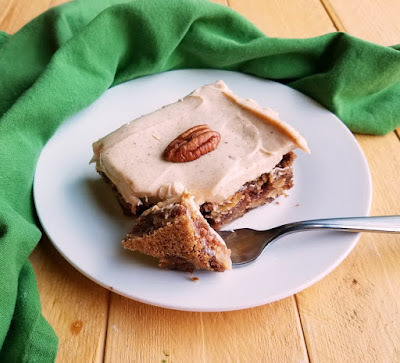 After the delicious applesauce cake from last year and the warm reception this cake got, it's a surprise that every post this week isn't a cake! Most and flavorful German apple cake is full of fresh apples and comes together quickly. 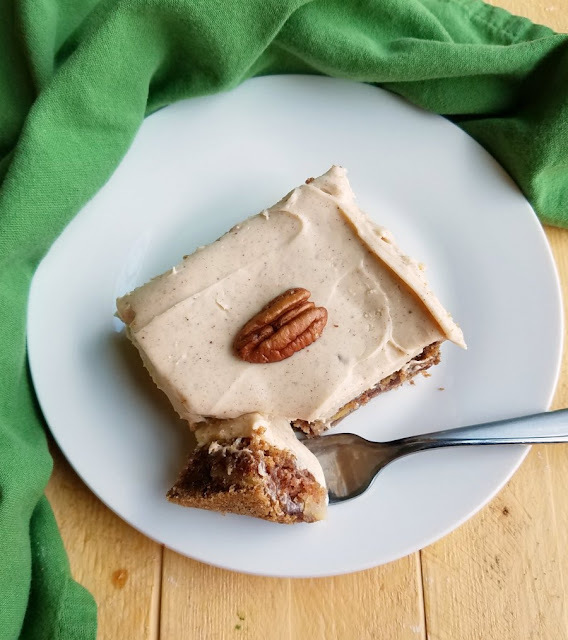 The cinnamon brown sugar cream cheese frosting takes it to the next level! In large bowl, beat together eggs, sugar and vegetable oil. Stir in vanilla. 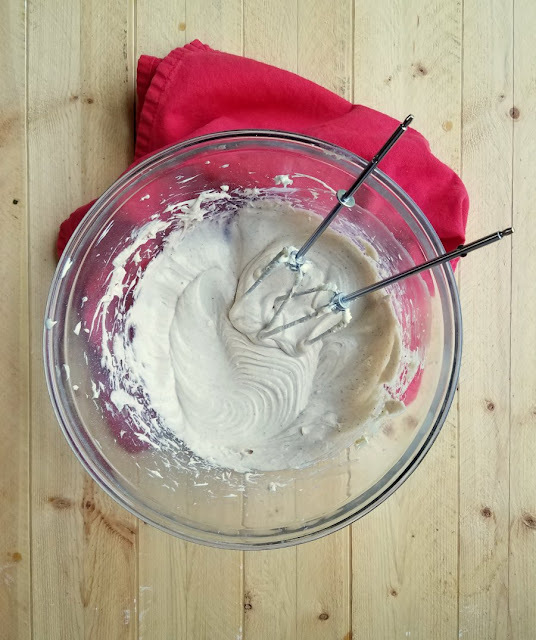 In a separate bowl, whisk together flour, cinnamon, baking soda and salt until combined. Stir dry ingredients into wet ingredients and then fold in the apples. In a large bowl, beat together cream cheese and butter until smooth and fluffy. Add powdered sugar, brown sugar, cinnamon and vanilla. Beat for 2 minutes or until completely combined and smooth. Garnish with nuts or a drizzle of caramel if desired. There she is, my queen of frosting..mmmmm, this sounds like a slice of apple heaven Carlee!!! YUMMMO!! I love that you added brown sugar to the icing! Extra yummy! I've never had a German Apple Cake but the way you describe it as a "cross between a blondie and a cake" it sounds hard to resist! And I love how you always come up with fun frostings! This cake sounds amazing Carlee, thanks so much for hosting this event. I am getting apple tomorrow and making this!!! 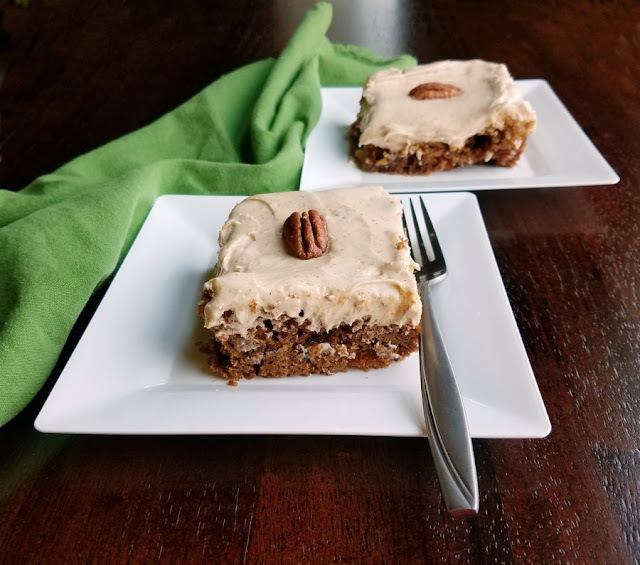 Apple cake with brown sugar frosting - Um Yes! 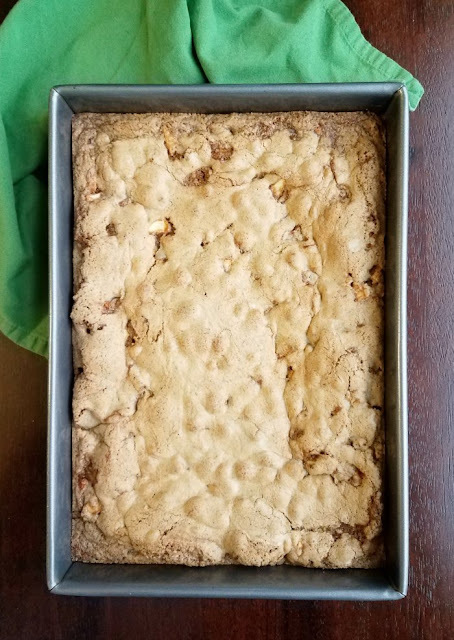 Hi Carlee, I popped by your blog a couple of days ago to hunt down that Dutch apple cake recipe (it's that time of year again) and saw this recipe! It nearly threw me, except I didn't have the cream cheese. I still made the Dutch apple cake, I do use brown sugar and add cinemon to the crumble topping of that too, just because I love the combination... I will be tryng this recipe out for sure! Did you mean "moIst - moist" and flavorful German...in the first line? Perfect to take along to a potluck! Will keep this one! 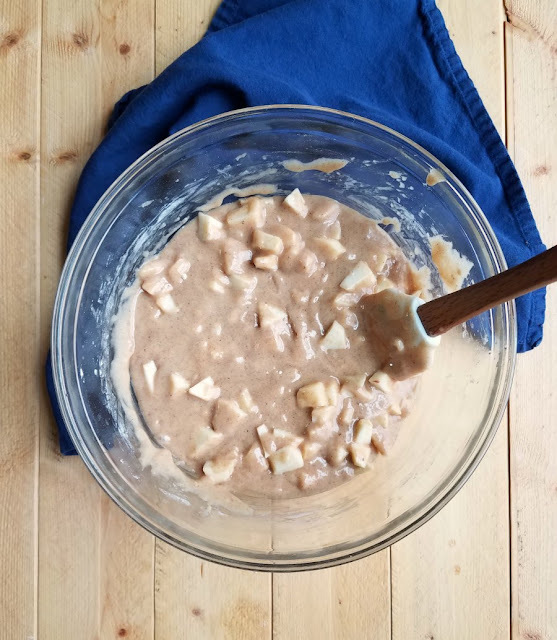 Thanks for the link up on our apple recipes for celebrate blog party! This looks really good. The cake sounds wonderful (like the perfect snack cake for mid-afternoon) but that frosting... cream cheese and brown sugar? Yes please! Your German Apple Cake with Brown Sugar will be a big hit here at the cottage. Thanks so much for sharing with us at Full Plate Thursday and have a great week! Oh my goodness, gimmie a fork! I will take all of your apple desserts. Thank you so much for sharing with us at the Whimsical Wednesdays Link Party! Have a great week, Carlee!